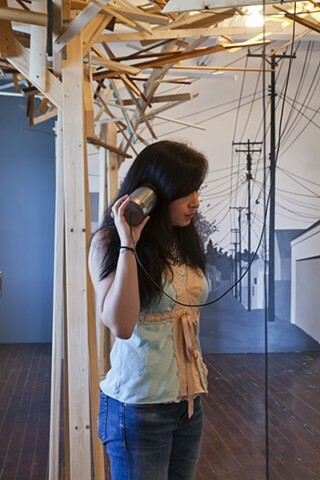 The sounds are presented to the visitors in tin can telephones that hang down from the forest of found alleyway wood- reclaimed wood from demos and new construction in town. A mural of my alley in Hamtramck (a part of Detroit) is painted on the back wall for context. The important part of the mural are the telephone wires that connect all the houses of the city. This motif comes off the mural to connect the wires that house the city sounds in the tin can phones. When you are standing in the installation it provides an illusion of space and a feeling that the tin cans are connected to the telephone poles. A metaphor for communication.